Spark is making its way across Canada (& beyond!) in shops that specialize in children’s toys, educational games, books as well as gift stores and tourist attractions. Kamloops -Lizzie Bits Baby Co. Port Moody – The Village Toy Shop – NEW! 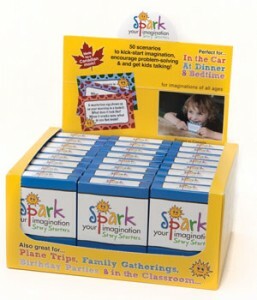 LearningToys.ca carries Spark Story Starters and with a minimum order shipping is FREE.